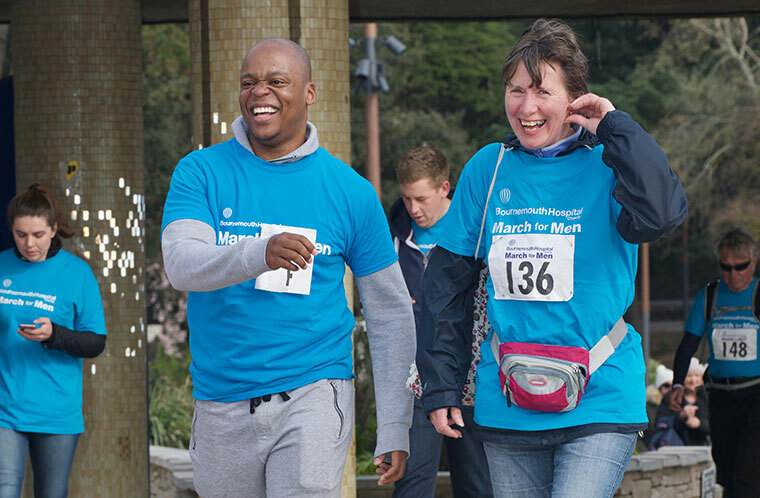 Registrations are open for this year's March for Men on Sunday 25 March, which will raise money for men’s health treatment at the Royal Bournemouth Hospital. One of Bournemouth Hospital Charity’s most popular events, March for Men, shines a spotlight on the tens of thousands of men’s health patients treated at the hospital every year. Everyone is invited to walk, jog or run either 1km, 5km or 10km along the Bournemouth seafront and help raise money towards men’s health treatment at the Royal Bournemouth Hospital. Entry is £15 for adults (over-16s), £8 for ages 5-15, while under-5s go free. The public can register online at BHCharity.org/m4m/ or by calling the charity office on 01202 704060. Bournemouth Hospital Charity’s events fundraiser, Karen Smith, says everyone is welcome to take part in this fun, family-friendly event. “Thousands of men from every part of our community are facing men’s health concerns such as prostate or testicular cancers,” says Karen. Since 2014, March for Men has raised nearly £80,000 for men’s health treatment in our hospital. This money has helped to turn dreams of getting innovative new equipment to improve care for our men’s health patients into a reality.